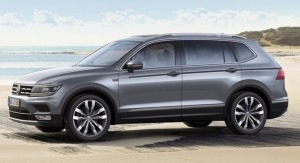 The Volkswagen Tiguan Allspace is the seven seat version of the Tiguan and a stablemate to the VW owned Skoda Kodiaq. 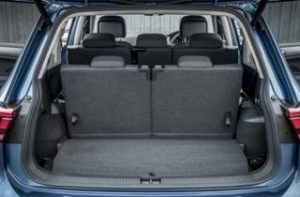 Compared to the standard Tiguan the Allspace sits on a wheelbase extended by 109mm, and is 215mm longer overall, which means more legroom, a larger boot (700 litres) or two extra seats. The rearmost seats in Volkswagen’s own words are only suitable for passengers up to five foot two inches in height. But even with all seven seat in place there is still enough room for a folded wheelchair or a couple of small suitcases, 230 litres. The Allspace also differs slightly in appearance from the standard car in that it has a taller radiator grille, the bonnet is higher, the rear doors are larger and a slightly altered roof making it feel much larger than the five seat Tiguan. 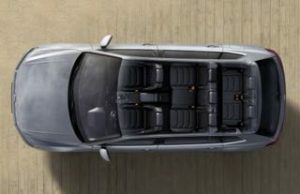 The Tiguan Allspace shares the internals of the Tiguan, so expect a practical, comfortable cabin with excellent views for drivers and passenger alike and a driving experience that will come as a surprise given the size of the car, 4.7 metres in length. 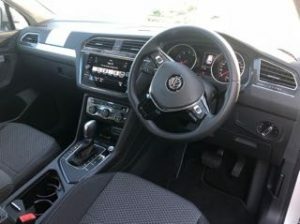 Second-row passengers are spoiled as the Allspace adds an extra 60mm of legroom and 54mm of knee room over the Tiguan and the large rear windows offer a near panoramic view. The second row seats recline and slide meaning that the third row occupants can have some well needed extra space, they also fold in a 40:20:40 configuration and the outside rear two have Isofix points, no Isofix for the centre or rear most seats. The third row seats fold flat to the floor with a click and a push and the boot floor is all but flat. Two trim lines are avaialble to Motabilty customers, the new ‘Match’ trim, and as a 2wd manual only the SEL trim. Match trim is excellent value, Adaptive cruise control (you set the speed and the Allspace will keep a safe distance from the car in front), three zone climate control, reversing camera with front and rear sensors, Park Assist, the car will identify and park into the bay autonomously, 19 inch alloy wheels, rear tinted glass, electric tailgate, keyless entry, lane assist (the car will automatically put you back into lane should you veer out of it). The touchscreen is eight inches in size and has built in sat nav and link to Apple Carplay and Android Auto and is one of the best systems on the market. The only thing missing from is heated front seats which are a £285 extra which are included on the SEL trim along with a 10.3 inch screen replacing the standard dials, a panoramic sunroof, massaging front seats and LED headlights. But you do loose Park assist and rear camera from the Match trim. The only engine choice on the Scheme is also the best one in the range, the 2.0 litre 148 bhp diesel. It has all the pulling power you need and the delivery is smooth and there is plenty of shove when needed thanks to the 340nm of torque. This engine is available in front wheel drive as a six speed manual or excellent seven speed dual clutch Automatic, it will reach 62 miles per hour in 9.8 seconds and on to a top speed of 126 miles per hour, economy is a claimed 56.5 miles per gallon (55.5 mpg as auto) which in reality will return around 45 mpg. This engine is also avaialble in all wheel drive as a seven speed automatic which adds the option to choose driving mode (On-Road, Off-Road, Snow and Individual) via a small wheel next to the gear lever, it does however cut the economy to 47.9 miles per gallon (test figures) but it does increase the towing weight capacity from an already excellent 2000 kg to 2400 kg.